Podcast: Who were the Vikings? 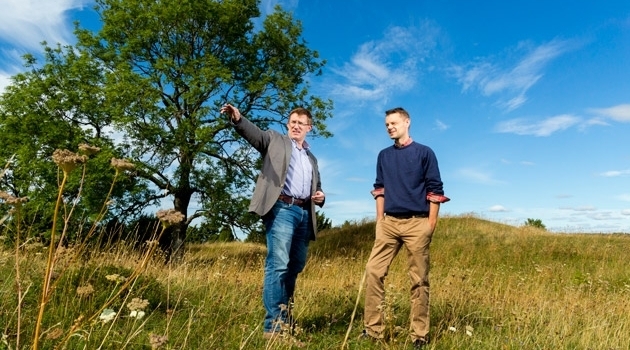 Neil Price and colleague John Ljungkvist in Gamla Uppsala, an important burial site during the Viking Age. The Vikings’ rampages affected languages, states and the power balances in large parts of Northern Europe. But many questions remain about the violent northerners, not least the reason for setting off on their conquests in the first place. Neil Price, Professor of Archaeology, tries to find out and talks in this podcast about the economic and cultural conditions which may have caused the Viking Age. The podcast is produced by Uppsala University, and is one of the episodes of “Forskarpodden”, where Niklas Norén and Jonas Löfvenberg meet researchers at Uppsala University.